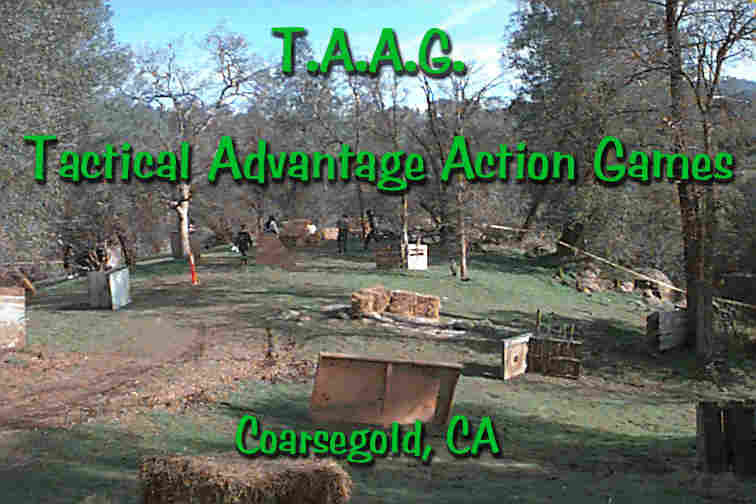 Easy to find and located just 25 minutes north of Fresno, CA off highway 41, T.A.A.G. is open every Sunday to groups of all sizes. Rental equipment and paintballs are available at very reasonable prices. Groups of more than 12 needing equipment require 2 weeks advance notice. Weekdays and Saturdays available by appointment. The field is located on 20 acres of foothill property and has a good mixture of natural and man-made bunkers. Large granite boulders, oak and pine trees are intermixed with manzanita and other shrubs. Man-made items include palette, plywood, spool and hay bale bunkers as well as a steel tower and a plywood castle. Play usually begins at 10 am and entry fees start at $10 a head. Bring your friends and family and a picnic basket for a great day in the foothills. New players would be well advised to wear long sleeve shirts and durable trousers (jeans). Lightweight cotton gloves are also nice to have.